In 1955 taking the General exam was a real stress test. I’m awake. It’s dark outside but today is the day. I am nervous. I shower and brush my teeth. My head is buzzing as I keep testing myself with all the stuff I studied for the last 6 months. Let’s see, what’s the formula for dB loss or gain in a circuit? Oh yeah, 10 log P2/P1. I’m not old enough to shave yet but I check the mirror for signs of any new zits. I close my eyes for a minute and I visualize the schematic for a Colpitts oscillator that I memorized months ago. Something’s wrong. I run back to my room and check the ARRL License Manual. ackk! I forgot the grid leak resistor! Man, the adrenaline is already at near toxic levels. I am repeating over and over in my head, grid leak, grid leak . . . I throw on my jeans, a shirt and my new pair of high-top US Keds. I grab three No 2 Dixon Ticonderoga pencils, slam them into my pocket protector and fly down the stairs. Wait? It doesn’t matter that I am leaving 2 hours early I have to get down to the FCC before I forget everything! “Eat first,” she says. “You’ll do better.” This is not a statement — it is a command. While I was getting dressed, my mother had come down to the kitchen and made breakfast. Our kitchen at home was like mission control and mom was its flight director. When she was in the kitchen, she was to be ignored at your peril. I manage to down a glass of orange juice, a bowl of corn flakes with a sliced banana and a glass of milk. I’m surprisingly hungry. All the time I am repeating formulas in my head Xc = 1/2(pi)fC, check — E = IR, check — E = MC2 — No! That’s from my physics class. Grid leak, grid leak, grid leak . . . I take a last glance at the License Manual. It’s hard to believe all the information that is packed into that book. It is hardly a book at all; just 108 pages, including the ads. The General class section was only 14 pages but it was my bible for now. I studied that thing all summer. I carried it everywhere folded in my back pocket. It had been folded in half so often it would no longer lay flat. Now, in my back pocket I cram the manual and my wallet. The wallet holds my Form 610, my Novice license and a $4 check for the application fee. In a flash, I am out the door. It is August and the humidity in New York hits you in the face like a left jab, but it does not matter today. I am impervious to natural phenomena like weather. I am a scientific machine on a personal mission; I am focused. The FCC gives amateur exams Tuesday through Friday. This Friday, it seems like a shorter walk than usual to the bus stop. The bus takes me to the subway, which takes me into Manhattan. It is rush hour already and the bus is crowded but it is of no consequence; I am present in body, but my mind is still regurgitating facts from the manual. I am headed for the great cathedral of Amateur Radio, the FCC offices at 641 Washington Street. There I would either be initiated into the exalted ranks of General class licensees or remain a lowly Novice for another 30 days. At the subway entrance, I meet three other guys from high school. We are all going to take the General exam today. We head into the subway tunnel and jump on the downtown train. We are yakking it up with nervous conversation as the train makes its way from Queens into Manhattan. We are talking about big Collins rigs and beam antennas as if we could afford to buy them and swearing we will still use mostly CW even after we get phone privileges. Two of the guys, Larry and Burt, are first-timers like me. Our fourth guy, Mark, is the veteran. He’s tried the test four previous times but flunked. I always thought I could master the theory but the code test was my nemesis. If I didn’t pass that, I wouldn’t be allowed to take the technical part and I would have wasted all that study time. Mark has the opposite problem. For him, 13 WPM was a walk in the park but when it came to the written test, he choked every time. I had an old phonograph that lived in our basement and a set of 78 r/min code records. Down there I practiced copying five letter code groups in solitude. Day after day, like a cloistered monk reciting the catechism, I plugged away at those records daily. I am in agony. My mind is not my friend today. It is torturing me in my head. You probably didn’t practice enough. You should have gone up to 18 WPM instead of stopping at 15. You didn’t do a practice run before you left the house. Like a dying battery, I can feel my code speed literally leaking out of my brain, every second I am sitting on the train. Will I have enough left when I finally get to the big moment? An eternity of time seems to have gone by when the train pulls into our stop at Christopher Street, I am still in my out of body experience, reciting stuff in my head; 20 meter phone allocation is 14,200-14,350 kc; diagram of a pi network; grid leak, grid leak, grid leak . . . It is a short walk to the federal building but I am still worrying if I will have enough code speed left to pass. Finally we turn the corner and there it is. As a 15 year old kid, this is my first encounter with government on any level. I don’t even have a learner’s permit yet! The building must be 20 stories high and it has one of those plain facades that had to come straight out of Orwell’s novel 1984. We cross the street and go through the revolving doors into a massive granite lobby. I have to keep moving. Every second I stand here my intelligence level is slipping away. I keep looking around to see if any dits or dahs have oozed out of my brain and fallen on the floor. The guard calls out from across the lobby, his voice echoing off the granite, “Seventh floor kid!” The lobby guard knows who we are! “Of course they know,” my mind screams out. “This is the federal government for crying out loud. Gad, there is no hope for me. I am getting slower by the minute. Out of the elevator and there it is. Right across from us is Room 748. One side of the hallway is a wall made of dark wood paneling about three feet high. The rest of the wall height is frosted glass, so you can’t see inside. Periodically along the wall, there are doors with similar frosted glass panels set in each door. I am staring at the door. Two lines painted in black on the glass scream at me, “Federal Communications Commission,” “Chief Engineer!” I am dumb struck. My 15 year old kid mind is on overload. I am not thinking about code. I am not repeating formulas and regs. I am catatonic. Our veteran, Mark does not seem awed by the FCC at all. Of course! This is his fifth attempt. He steps boldly across the hall and opens the hallowed door and steps inside. In my trance-like state, I follow. The room seems enormous. There must be at least 30 guys in there seated at desks and they all seem dressed alike. White shirts; with the long sleeves rolled up to the elbow and a black tie. This must be the official FCC uniform. The desk closest to the door calls out, “Yeah kid, whaddayawant?” I seem to have lost the power of speech. I reach in my back pocket, grab my stuff and thrust it out in front of me. I hope he can figure it out because I can’t talk. My personal copy of the ARRL License Manual is laying on the FCC guy’s desk, folded in half. It had been in my back pocket on the ride down here and now it won’t spring open and lay flat. The breezes from the fans in the big room keep moving it, like some newly caught fish flopping around on the pier at Coney Island. I go through the door into the next room. There are 30 or so wooden tables in here. The room is full. Are they all taking the same test? I don’t care. I have lost sight of my three friends, Larry, Mark and Burt. I’ll meet up with them outside. Or maybe I will just go home by myself. If I flunk, I don’t want to talk to anyone who passed. I just want to get this over with. Every desk has room for two. There are two sets of headphones and two straight keys screwed to the desk. I get out my trusty brand new No 2 Dixon Ticonderoga and write my name on the top of the page. I am pressing so hard that before I get past the “R” in my name, I hear the pencil point snap — “Crack!” I get a backup pencil from my pocket protector and finish writing my name, pressing not quite so hard now. I am ready for the moment of truth. This is the culmination of my entire life purpose to this point. I am pumped. My heart rate is redlining. I put the headphones on and my pencil is poised over the yellow page. Suddenly, I hear a series of dits and dahs over the headset. I recognize the letter and write it down, then the next letter and the next. Wait a minute. These aren’t five letter code groups. They are real words! For an instant, panic seizes me but the letters keep on coming. By now I am into a rhythm of copying the code. I realize after a few letters, I can recognize the word that is being sent and I know what the next few code characters will be, like Cliffs Notes for Morse code. Finally the letters stop. The examiner collects all the yellow papers. He looks like Lurch, the Addams family butler. He goes into the main room. I am not a fidgeter but I am fidgeting. For the only time in my kid life, I am grateful to Mrs Goldblatt my fourth grade teacher. I recognize it as the Gettysburg Address, which we had to memorize for her. For crying out loud! My mind is hard at work complaining again. What kind of a code test is this? People don’t use words like fourscore and consecrated, anymore! Lurch is still waiting. He has donned a set of headphones and plugged them into a spare jack on the table. If this weren’t a matter of life and death, I’d be laughing; Lurch with headphones! Lurch is not laughing. I slam on my headphones and hit the straight key. I am blazing away at around 15 WPM, even remembering to pause between words. I get through maybe three sentences and Lurch pulls the card away. “OK kid, you passed,” his bass voice is so low on the scale, I can feel my teeth vibrating as he speaks. I passed! I’m over the hump! The only thing left now is the written exam. Grid leak, grid leak . . . I am starting to recite in my head again. I don’t know what time it is. I can see that it is still light outside but I don’t care. Time has lost all meaning to me. I am halfway through the biggest thing I have ever tried and that is all I care to know. Lurch’s assistant, a guy with a bald head and a green eyeshade comes into the room and passes out an exam booklet, a few sheets of blank paper to work the math and an answer sheet to each of us. The test is 50 multiple choice questions. You have to mark the column corresponding to the right choice on the answer sheet for each question. We also get a book of trigonometric tables for looking up logarithms, tangent values and such. A few of the older guys have slide rules but no calculators in 1955. I still have two good Dixon Ticonderogas in my pocket protector. “Begin,” Lurch commands. Good test protocol is to look over the exam and get a feel for the test first. The heck with that idea, either we come back victorious or we don’t come back at all, to paraphrase General Patton. I hit the first question and all the knowledge I acquired in the last 6 months comes vomiting out of me and onto the answer sheet. I have total recall on regulations and for every formula. Like a flood gate opened, I roll through those 50 questions at near light speed. I recognize every circuit diagram and can even point out the grid leak resistor in the Colpitts oscillator circuit. Thirty minutes from Lurch’s “Begin” command, I am done. No one has left the room yet. Either I am the brightest guy there or I have made the biggest series of bonehead mistakes possible. For the next hour, I force myself to go over every question and redo the math carefully. “Are we done now,” my mind says? I don’t like the tone of that thought, but I have nothing left. I am drained, emotionally and physically. Slowly, I get up and hand my answer sheet to Lurch. “Wait outside kid. We’ll let you know in a little while.” At this point, I am prepared to wait till hell freezes over. I grab my License Manual from the front desk and go out into the hall. I suddenly realize that I need to find a restroom. I run down the hall, my Keds squeaking on the polished floor as I look for the men’s room. By the time I return, Larry, Burt and Mark are all outside in the hall. Mark thinks he flunked again. The rest of us feel pretty good. We are trying to remember the answers to specific questions but it is all a jumble. I am holding my license manual in my hand rolled up into the tightest cylinder imaginable. I don’t think anyone at ARRL imagined their book as a stress relief tool but I am squeezing it for all I am worth. Finally, the door to Room 748 opens wide enough for a disembodied arm to reach out and stick a list to the glass next to the door. Quickly, the arm disappears. All the waiting candidates are jostling for a look at the list. There is a lot of pushing and shoving but finally I see it. There it is. My name and next to it — Passed! Mark passed too. I am glad for him. So do Burt and Larry. I am grateful that we all passed. The last thing I want to do now is commiserate with someone who didn’t. We are now exalted General class hams with all operating privileges. I can’t feel the floor. It seems for the moment that I have levitated about 6 inches. We decide to get out of there before they change their mind. Down the elevator we go, to the subway stop and the train ride home. We are still talking about the test questions and which ones we got right or wrong. The journey home seems ethereal, a different kind of out-of-body experience than this morning. I am daydreaming of rare DX, powerful transmitters and big antennas. Off the train, I bid goodbye to my companions and jump on the bus toward home. I can’t wait to tell somebody. When I get to my bus stop, I fly off the bus and run home as fast as my sneakers will take me. Mom is at her command post in the kitchen. “Mom, I passed,” I yell! Nice? This is the greatest achievement of my life. Nice? That’s it? I can’t really blame mom for missing the enormity of this achievement. She wouldn’t know a grid leak resistor from a golf ball. “You look tired,” she says. “I’ll make you a sandwich and you’ll feel better.” I suddenly realize that I hadn’t eaten anything since this morning. I wolf down a salami sandwich and a glass of milk. I feel better but there is the feeling that if I don’t tell somebody, I will explode. I run upstairs to my bedroom that doubles as my ham shack. My Novice rig is a little Ameco CW transmitter that puts out about 7 W and a Hallicrafters S38-C. I put my 80 meter crystal in the rig, tune up in the Novice band and call CQ. After a couple of tries, this station with a powerful signal returns my call. I whip out my Dixon Ticonderoga and I am ready to copy. He is not a Novice station. His code speed is easy to copy. He gives his location as New York City, sends me a 599 signal report and turns it back to me. I am writing all this down for the log. I answer and give him the same signal report and my name. I can contain myself no longer so I tap out, “PASSED MY GENERAL TODAY” and turn it back to him. I am expecting hearty congratulations or the secret General class CW handshake or some sign of special recognition. He answers and I am decoding each letter he sends, “I KNOW KID — CONGRATULATIONS.” He knows! How could he know? Only four people on the planet know and one of those is my mother! I never met Lurch or worked him again but I will never forget that contact. 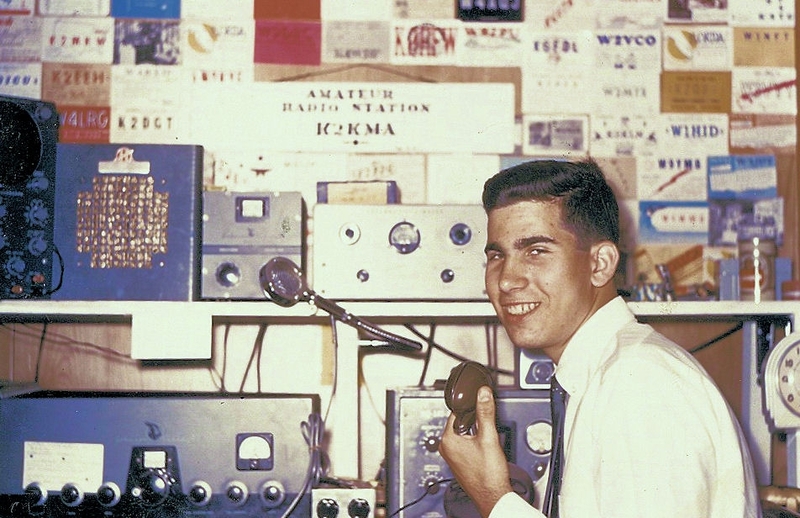 Ron Litt, AE5NO, an ARRL member, was first licensed in 1954 as KN2KMA. Ron currently holds an Extra Class license. Ron left the hobby in the ’60s to pursue career and family. After relocating to the Dallas area in 2009, he revived his interest in Amateur Radio. Ron currently lives in Plano, Texas. He is a member of the Plano Amateur Radio Klub (PARK) and the McKinney Amateur Radio club. His favorite activities are contests and homebrew antennas.